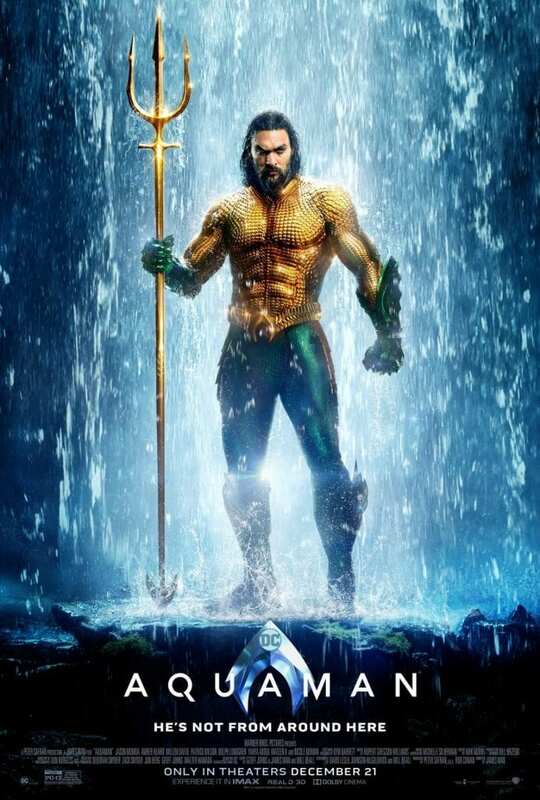 “Aquaman” is directed by James Wan and stars Jason Momoa as Arthur Curry/Aquaman, Amber Heard as Mera, Patrick Wilson as Ocean Master, Nicole Kidman as Atalanna, Yahya Abdul-Mateen II as Black Manta, and Willem Dafoe as Nuidis Vulko. “Aquaman” currently sits at only 64 percent on Rotten Tomatoes with a 79 percent audience score. Despite this, its box office numbers are astoundingly impressive, grossing over $1 billion at the global box office and surpassing “Wonder Woman” as the most financially successful DC Extended Universe film to date, despite mediocre reviews. What is bringing people to the theaters to see this film specifically? Although DC was expected to make this film, Aquaman as a character had to be redeemed from his comical treatment in other pop culture. Especially in the 1960s, Aquaman became one of the silliest comic book characters ever and has since been mocked for being useless other than having a strange ability of talking to fish. Director James Wan had to take on the task of making Aquaman relevant again in pop culture, yet Wan also crafts an utterly ridiculous and wild tone that keeps audiences engaged and entertained. One scene specifically stood out to me as a good summary of the experience of watching this film. In this scene, some tough guys at a bar approach Arthur and ask him if he is the “fish boy,” which is already somewhat comical. Arthur turns around and says “it’s fish man, what do you want?” We see a couple other buff guys start to circle around Arthur slightly, and on first viewing everyone assumes this is where we will see a bar fight scene and get to see Arthur fight hand-to-hand. However, instead of that, the lead man says “I tell you what I want… can we get a picture with ya?” At first, Arthur is as surprised as the audience is that he didn’t want to fight, and they take one of the most awkward selfies I have ever seen. Following this, we get a brief but hilarious montage of Arthur taking pictures with these random folks, in which he is at first quite reserved but eventually starts smiling, sticking his tongue out, and doing all kinds of ridiculous and fun poses with them. End scene. On its own, this scene is nothing more than a fun moment of humor and a fairly clever reversal of expectations. We don’t learn much about Arthur other than that he has a fun personality, and his behavior changes in the scene mainly because it works better in the scene if he acts in a sillier way. His behavior changes simply because it needed to, but it is still entertaining to watch Jason Momoa act out this scene like only he could. This scene summarizes my experience with “Aquaman.” Just as this scene is pure fun without deep motivations or character arcs, so the film as a whole is mostly just an entertaining and colorful film because it lacks character motivations or clear arcs. Characters change behavior mostly because the story requires them to, or they simply do not change at all. The film is a fun romp that fully leans into the ridiculousness of what a comic book movie can do – take, for example, a giant octopus playing drums in Atlantis – but the writing is truly underwhelming and discourages me from re-watching this film or recommending others to see it. I truly cannot tell you a difference between Jason Momoa and Arthur Curry because I have no clue what is driving his character forward or what his arc is supposed to be, but the film’s pacing kept me engaged for the whole runtime regardless. That said, take nothing away from the direction of James Wan. He has crafted a truly beautiful film, one in which Atlantis looks and feels like a real city, the colors are wonderful to take in, and the action sequences are truly well choreographed. I noticed several one-take shots in this film that require more effort to create than other directors might attempt, and having such shots along with several establishing shots made the action much easier to follow and much more entertaining. Although I felt like the characters had barely changed since the start of the film, the action finale was satisfying nonetheless. The film’s villains, Ocean Master and Black Manta, give serviceable motivations and decent performances, but nothing about either character is especially memorable. Ocean Master seeks the power to rule Atlantis and command all seven seas so that he can wage war on the surface world for crimes like their pollution of the seas, but aside from pollution he mostly just wants power. Meanwhile, Black Manta seeks vengeance for the death of his father because Arthur Curry let his father die. You would think this has real emotional weight, and although the film tries to provide Black Manta’s backstory and cement him as a threat, his appearances in the film are too few and far between to have a truly significant impact on the plot. Essentially, if you have seen the extended “Aquaman” trailer, you have seen most of Black Manta in action, which is somewhat disappointing. The verdict? If you want fun, dumb action, good performances, and a film that is self-aware of its own ridiculousness, “Aquaman” is the film for you. If you want an excellent script with complex characters and a sophisticated narrative, you will be disappointed. “Shazam!” will be DC’s next release this year on April 5th.